Motto: Michigan's Community of Vision. 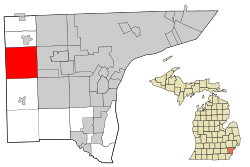 Canton is a charter township of Wayne County in the U.S. state of Michigan. It is located about 8 miles (13 km) west of the city limits of Detroit and 8 miles (13 km) east of the city limits of Ann Arbor. As of the 2010 census, the township had a population of 90,173, making it Michigan's second largest township and eleventh largest community. Canton is ranked as 96th highest-income place in the United States with a population of 50,000 or more. Canton Township is also consistently ranked as one of the safest cities in the United States, as well as in the state of Michigan. In 2015, the township was ranked as the 29th safest city in America. Canton is one of Michigan's fastest growing communities. Sheldon or Sheldon's Corners is a historic locale in the south of the township on U.S. Highway 12 just west of Interstate 275 at . It is named after Timothy F. Sheldon who purchased lands there in 1842. Cherry Hill is a historic locale in the west of the township at at the intersection of Cherry Hill Road and Ridge Road. It is the site of a new urbanist neighborhood with architecture that is supposed to be reminiscent of what Canton was like a hundred years ago. It is located on a rise over a branch of the Lower River Rouge. It is now the site of a theatre, the Village Theater. Earlier, on October 20, 1829, the legislature had passed a bill creating the townships of Lima and Richland out of Bucklin Township. Governor Lewis Cass returned the acts unapproved, citing a conflict under the law. The names conflicted with post offices in existence, contrary to a territorial law from April 12, 1827, prohibiting incorporation of a new township bearing the same name as any existing post office. The legislature thus had to substitute the names of Nankin and Pekin after the cities of Nanjing (Nanking) and Beijing (Peking) in China. The name of Pekin was extinguished when it was renamed Redford in 1833. The Township of Canton was created by act of the Michigan Territorial Legislature on March 7, 1834 out of a southern portion of Plymouth Township. It was named in honor of the port and provincial capital known historically as Canton, Imperial China, which in 1918 was renamed Guangzhou (Chinese: 廣州; pinyin: Guǎngzhōu) — now the capital and largest city of Guangdong province, People's Republic of China. In the summer of 2002, the emerald ash borer was discovered in Canton, eventually infesting the Great Lakes region. The Canton Historical Society and Museum opened in 1982 in a one-roomed schoolhouse. According to the United States Census Bureau, the township has a total area of 36.0 square miles (93 km2). No part of the total area is covered by water. The south of the township is drained by the Lower River Rouge and its tributaries, including Pine Creek, which drains from the northwest corner to the southeast. The northeast is drained by Tonquish Creek and Garden Creek, which are tributaries of the Middle River Rouge. Canton-Plymouth-Mettetal Airport is in Canton Township. The U.S. Census Bureau also defined Canton Township as a census-designated place (CDP) at the 2000 Census so that the community would appear on the list of places (like cities and villages) as well on the list of county subdivisions (like other townships). The final statistics for the township and the CDP were identical. As of the census of 2010, there were 90,173 people, 32,771 households, and 24,231 families residing in the township. The population density was 2,121.5 per square mile (819.0/km²). There were 34,829 housing units at an average density of 789.8 per square mile (304.9/km²). The racial makeup of the township was 72.2% White, 10.2% African American, 0.2% Native American, 14.1% Asian (80.0% Indian, 2.2% Chinese, 0.7% Filipino), 0.0% Pacific Islander, 0.7% from other races, and 1.91% from two or more races. Hispanic or Latino of any race were 3.1% of the population. There were 27,490 households out of which 42.0% had children under the age of 18 living with them, 63.4% were married couples living together, 8.6% had a female householder with no husband present, and 25.2% were non-families. 20.5% of all households were made up of individuals and 4.8% had someone living alone who was 65 years of age or older. The average household size was 2.77 and the average family size was 3.26. The median household price was $239,900 according to the U.S. Census Bureau's 2006 American Community Survey estimates. In the township the population was spread out with 29.0% under the age of 18, 8.0% from 18 to 24, 34.9% from 25 to 44, 22.1% from 45 to 64, and 5.9% who were 65 years of age or older. The median age was 33 years. For every 100 females there were 98.0 males. For every 100 females age 18 and over, there were 96.2 males. According to a 2007 estimate, the median income for a household in the township was $82,669, and the median income for a family was $95,267. Males had a median income of $61,570 versus $35,615 for females. The per capita income for the township was $28,609. About 2.9% of families and 3.7% of the population were below the poverty line, including 4.2% of those under age 18 and 5.5% of those age 65 or over. Gurudwara Sahib Sikh Temple, Canton Center Rd. Canton, Michigan Facts for Kids. Kiddle Encyclopedia.